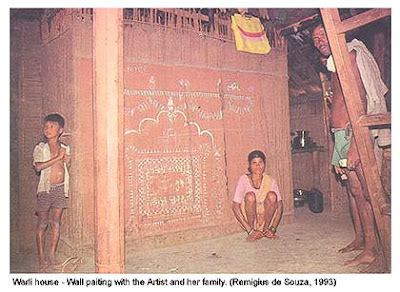 Warli painting is the DOMAIN OF WARLI WOMEN, unlike male chauvinist civilised societies. Warli Painting, like their dances and music, is part of their life and culture and not a separate department for the so-called gifted artists in the civilised societies. Warli Tribe have neither gender issues of discrimination or prostitution like in civilised societies. However, we notice that the do-gooder urban elites are promoting their own values and encouraging males to paint for publishing and marketing Warli Art. They don’t learn because they can’t appreciate Tribal values. This missionary work is most detrimental to tribal culture.